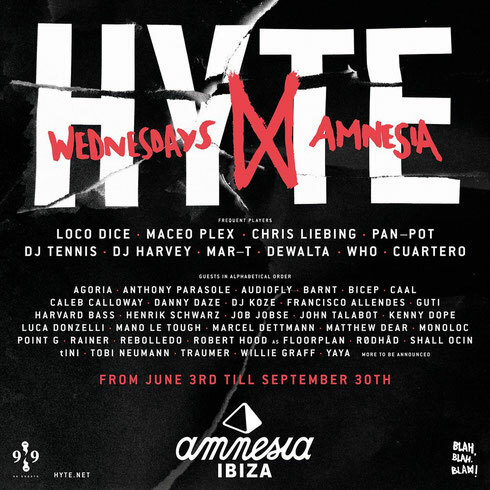 HYTE recently announced their summer plans for Ibiza. The global event series continues to build on the foundations laid in Berlin, New York, Amsterdam and Barcelona with an 18 week residency at Amnesia in Ibiza. The series will focus around a core family of artists that include Loco Dice, Maceo Plex, Chris Liebing, DJ Harvey, Pan-Pot, DJ Tennis, Mar-T, Dewalta, Who and Cuartero. As with previous HYTE events there will be many more guests from across the house and techno spectrum. The opening event on 3 June sees Loco Dice on the terrace all night long with Point G (Live), whilst Chris Liebing, Mar-T and Cuartero take over the club.